Curious about how our police department works? Participate in the Bainbridge Island Police Department (BIPD) Citizens’ Academy, beginning this February. This free 12-week program lets you meet police officers and see their work first-hand; listen here to learn more. 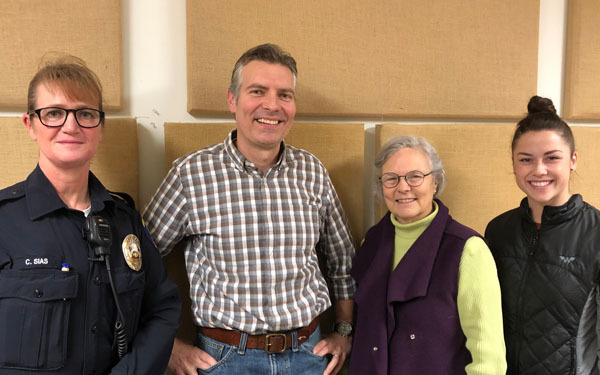 In this podcast, BCB host Christina Hulet sits down with Carla Sias, BIPD’s Community Resource Officer, and three community members who went through the Academy: Loren Bast, Kaylie Chinn, and former Mayor Anne Blair. Together, they talk about what it was like to visit the Kitsap County Jail and participate in a mock trial at the courthouse. Participants also get to ride with an on-duty patrol officer, go to the 911 dispatch center and Coroner’s Office, and talk about a range of topics such as traffic enforcement, investigations, narcotics, criminal law, defensive tactics and identity theft. It’s a great way to increase communication between residents and police officers and, in the case of Kaylie Chinn, confirmed her decision to go into law enforcement. Classes begin in early February and are held Wednesday evenings from 7:00 to 9:00 p.m. with two additional Saturday sessions. Credits: BCB host: Christina Hulet; audio editor and publisher: Diane Walker; social media: Jen St. Louis.